← The president names a science adviser. 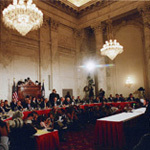 Confirmation hearings – then and now. It’s the year 2018. The president has nominated you to serve as his science adviser. You’re seated before a committee of Senators. They’ll make an initial call on whether or not you should be confirmed. One asks, then another (with variations on the same theme): Is climate change real? What should we do about it? Sitting there, with the lights up, the video running, the cameras clicking, you know two things of a certainty. First, the people who sent you here, the people who nominated you, have expectations about your answer. They’ve asked you the same questions – repeatedly – in interviewing you for the job, and they’ve heard, mulled over, and reacted to your answers. They’ve made clear what attributes (substance, stance, tone) they consider preconditions for the job, not just for the hearing but for the remainder of your tenure. The community you hail from, that is, your fellow scientists from your discipline, your fellow faculty members, your family – the people who shaped you, made you who you are – they have expectations too. Everyone wants to hear you to say certain things in a certain way. The intersection of all these expectations is essentially a null set. Second, you know that whatever you say, however you say it, your answer will serve as a springboard for criticism from every quarter – from the Senators present, from the scientific community, from the news media. What’s more, much of what those people will say has already been predetermined – rather than having much to do with what you will actually say. In part, that’s because we human beings don’t always just believe what we see. To a great extent we see what we believe. We find what we’re looking for. Before we turn to that question, it’s worth noting that things haven’t changed all that much. Case in point: some 2000 years ago there was another conversation, really a confirmation hearing of a sort, considered so remarkable by those “in the room when it happened” that they carefully, meticulously, passed the transcript down through the ages. Very few documents have survived from that period, but this one did. It mattered that much. They were indeed amazed… and so are we, even millennia later. What an answer! Again, how do you respond? A final observation. There’s little joy in debate. Not for you, certainly, but for not for anyone else in the hearing room either. Fact is, any satisfaction from scoring debating points is fleeting at best. The antibodies you build up on the other side endure. But it’s possible to make it clear, perhaps not in so many words, but through tone, that you’re not interested in adding to the country’s polarization, fractiousness, division, distrust, and pain. There’s more than enough of that to go around. But if the people in the room want to join in a search for truth (including but not limited to what does scientific evidence say about climate change? What mitigation and coping options are available to us?) – you’re all in. Note that there are many other such vexing questions at the intersection of science and policy, touching on when life begins, creation and evolution, the health implications of nanotechnology, genetically modified foods, vaccinations, and more. Matthew 22:15-22 NIV. Of course, this was a confirmation hearing of a different kind. Jesus made a simple claim, that he was the son of God. He had quite a resume: wise insights, healings, even bringing a friend back to life. But based on this hearing, and others, people were troubled. The concern was non-partisan. Not one, but all parties – Romans, the Jewish leaders, the people – agreed he should be put to death, and carried out the execution. But there’s been continuing disagreement about what happened next. 2 Responses to Confirmation hearings – then and now. This is a great post, Bill.